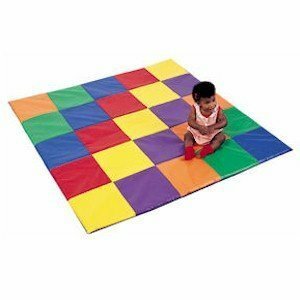 "This primary-colored, 57"" x 57"" multi-purpose mat is a comfortable multipurpose play surface for all ages. ALLOW UP TO THREE WEEKS BEFORE SHIPPING, AS CHILDREN'S FACTORY EDUCATIONAL TOYS ARE MADE-TO-ORDER. The Children Factory's Primary Patchwork Crawley Activity Mat is perfect for resting, nesting, bonding or just a gently soft place to enjoy imaginative play! This child's floor mat has four repeating pastel colors. The colorful play surface will stimulate imaginations while combining cognitive stimulation and gross motor play. This big child's floor mat can accommodate several active children. This activity mat is perfect for group activities, resting, bonding or just a gently soft place to enjoy creative play! It's an educational toy that ideal for floor activities. Easily wipe clean. Great for school age activities and shielding from non-hygienic surfaces, or a gentle soft place for just PLAY! Not suitable for tumbling or gymnastics. 1"" thick activity mat is 57"" diameter. 14 oz. nylon-reinforced vinyl play surface is an easily-cleanable hygienic spot for child activities. Virgin foam core. A quality Children's Factory product. SHIPPING NOTE: Children's Factory products are shipped directly from the manufacturer and may take up to three weeks before shipping. But considering all the creative enjoyment they will bring, they're well worth the wait. " 57" square x 1" thick. Vinyl covered nylon mats are easily cleaned with soap and water. Great for school age activities.